Make a rough paste by pounding chili peppers, salt and garlic (including peel) in a mortar with pestle. Place a wok on the stove and heat oil. When hot, add the paste and stir very quickly (do not allow it to burn). Add the ground beef and stir-fry very quickly over a very high heat for about one minute until the beef is almost cooked. Season with fish sauce and palm sugar; stir to evenly distribute seasoning. Turn off heat and add holy basil leaves. Serve over rice with a fried egg, sunny side up. Transfer the mixture to a saucepan, stir to mix well, and bring to a boil. Reduce the heat and simmer in order to allow the sauce too evaporate and thicken. Once the liquid is reduced by almost half and tastes sweet, sour and slightly salty, allow it to cool. Once cooled, transfer to an air-tight container and refrigerate until you’re ready to make Pad Thai. 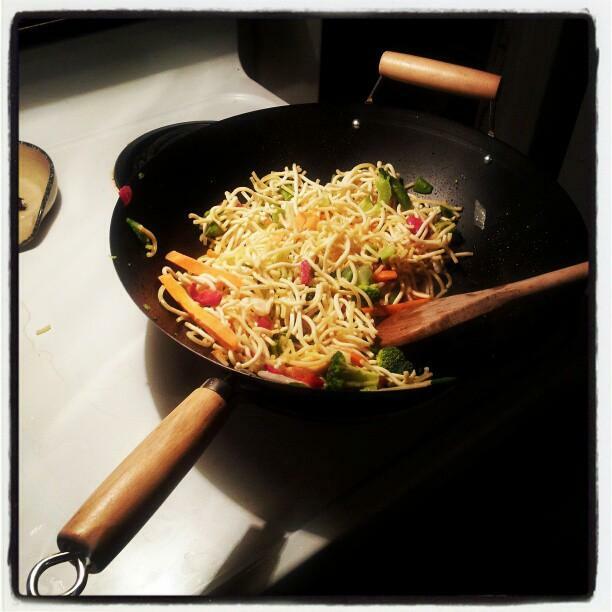 In a wok, heat 2 tablespoons of the oil over moderate heat. Add garlic and stir-fry until fragrant. Add prawns and stir-fry until pink but not cooked through. Immediately take out of the wok and reserve. In the same wok, add a little more oil, then add white bean curd and dried shrimp. Stir-fry until bean curd browns. Add the noodles and stir-fry to soften. Add Pad Thai sauce a little bit at a time. Stir-fry to mix quickly. The noodles will soften further and absorb the flavors of the sauce. Taste. If the flavors are not intense enough, add a little more sauce and allow it to seep into the noodles. Add the Daikon and more dried shrimp. Stir-fry to incorporate the ingredients. Move the noodles to one side of the wok. Raise the temperature and crack the eggs into the clear side of the pan. Cover the eggs with the noodles. Reduce the heat a little and allow the eggs to cook. Toss all the noodles together to spread the eggs. Mix in the bean sprouts, chopped chives and peanuts. Serve the Pad Thai, garnished with fresh bean sprouts, chives, lime wedges and a banana blossom if available.